Is electrical test a bottle-neck for productivity? EXT maximizes your prober efficiency without sacrificing test accuracy. Speed up testing AND assure 100% test of your product with EXT. Drag and drop input. A wide variety of inputs are supported, including RS-274X, RS-274D, ODB++, DXF, DWG, GDSII, DPF, Drill, IPCD356, IPCD356 A, IPCD356 B, Mentor Neutral, Pads ASCII, Accel ASCII, Integra, TXF, Pdif, and more. Generate a netlist from your design data. Calculate adjacency, buried resistance and circuit resistance to include with output. Line of Sight adjacency offers the most efficient method of reducing the number of probe hits, and still gives you control over testing tolerances. Eliminate unneeded test points on plane layers while assuring 100% test. 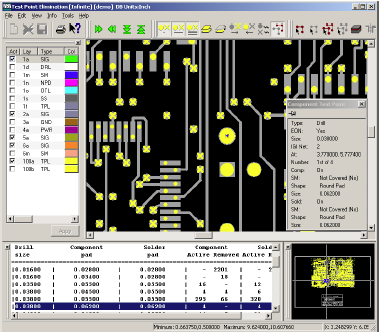 Include all the components and vias, components only, or end points of the nets. Avoid recalculating test points for unchanged circuits during revision cycles by saving and restoring the test point database. Save time and scrap with the proven reliability of EXT’s netlist extract, ability to compare nets between revisions, and graphical viewing of nets, test points, and data. Output to standard formats such as IPC-D-356A, MicroCraft, ATG, ECT, Probot, as well as RapiTrim Resistor Trimmer. Graphically view opens and shorts. Save, restore and compare test point database for quick test point generation during revision cycles. For buried resistor nets without accessible test points near-by, circuit resistance can be added the buried resistor value. Display layers independently and in separate colors for the layers the network resides on. Netlist outputs include IPC-D-356A, MicroCraft, ATG, ECT, Probot, Mania, RapiTrim Resistor Trimmer, and more. Many other output formats available, including RS-274X, RS-274D, ODB++. Contact Us for more information about EXT.